Well hello there! Due to lack of tacos in Europe and my need for a little offseason, I have been off the taco bandwagon for far too long. Never fear - I am back and excited to train, eat tacos and tell fun stories about them for the foreseeable future! The offseason is a tricky time of year. The harder I train, the more I require time to rest and recover from the mental and physical demands of a long season of bike racing. I always try to plan my offseason for a time when I can really step away and spend time doing things that often get pushed to the side during busy times of training and racing. It is a chance to spend time with friends, go on adventures off the bike, treat yourself and find the focus and motivation to hit the ground running when training starts again. This season, I just took my two weeks off the bike at the beginning of October and really got some deep mental rest that has left me eager to start working towards 2019. One of the best parts about the offseason for me is getting to plan adventures with my friends and family that don’t have to revolve around my strict training schedule. One such adventure was a short backpacking trip with one of my best friends Mckenna. We grew up just a few houses away from each other and met in middle school. Since then, she has been one of my closest friends and a huge supporter of my cycling career. Often during the season, however, it is really hard for me to spend big chunks of quality time with my close friends between travel and training. So - to take advantage of my time off the bike, we planned a ladies backpacking trip that really just turned into a long walk for tacos. Get the low down on our epic adventure and tasty taco extravaganza below! The adventure: While we had planned a more extensive trip, we ended up having to shorten our trip and decided to stay very local in Marin. 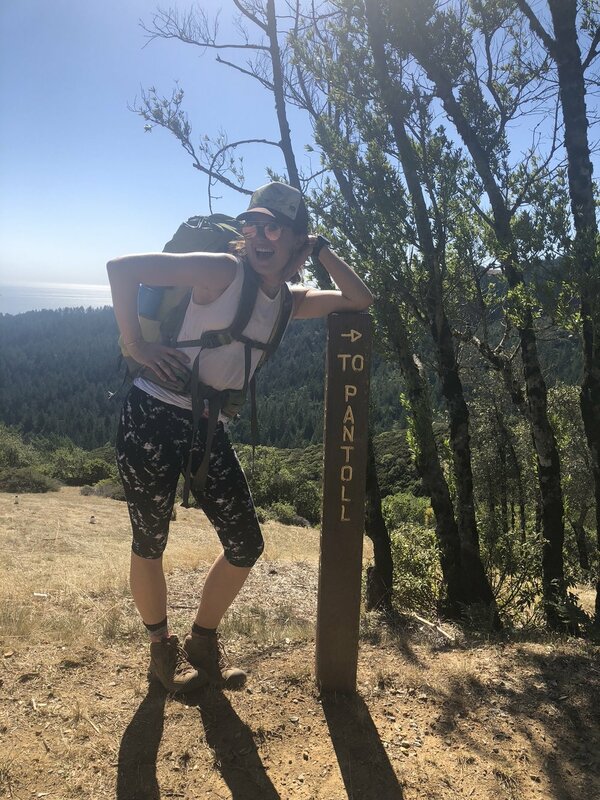 On the first day, we backpacked to Pantoll campground, set up camp and then hiked down to Stinson beach. For anyone looking to plan a similar trip - Pantoll makes things incredibly easy as campsites are on a “first come, first serve” basis and they have specific sites reserved for bikers/hikers. It would also be an easy option if you’d like to drive and start/end at the campsite there. To simplify our trip, we decided not to bring our camping stoves and opted to just stop at a quick, casual restaurant that next day. After a quick dip in the ocean (much needed after 14 miles of hiking! ), we walked up to a great new restaurant on the edge of the beach - more on that in the taco section. We hiked back to camp after dinner, spent the night and woke up early to hike to the summit of Mt. Tamalpais before heading back home. While our trip was short and simple, it was absolutely incredible and showed the power of just getting out to explore your own backyard. It was also a great reminder that the imperfect camping trip you actually go on is infinitely better than the “perfect” trip you plan but never commit to. Sometimes, you just have to go for it. Additionally, while I spend a lot of time on Mt. Tamalpais on my bike, I had never explored many of the fire roads and trails on foot and it gave me a new appreciation of the amazing places I get to train. It also gave me an appreciation for how much faster it is to ride a bike :) Perfect motivation to get back to training! The taco spot: The Siren Canteen is a new little restaurant at the edge of Stinson beach that serves a variety of tasty treats including tacos and burritos. The atmosphere itself is somethings special. We walked up to order and then sat at a table by the window, overlooking the ocean on a sunny fall day as we waited for our food. Just sitting on the covered patio and enjoying the view was magical and a perfect break for our tired legs. I ordered three tacos - one vegetarian, one shrimp and one fish. We were right on the water so some sort of seafood just felt right. The shrimp taco was probably my favorite, with tasty seasoning and good pico de gallo salsa. The vegetarian taco had a generous helping of avocado, but unfortunately also came with a generous helping of sour cream which I am not a huge fan of. I’d recommend ordering the tacos without sour cream! The corn tortillas were a bit soggy (possibly related to sour-creamgate) but they got the job done and were the perfect way to refuel for the rest of the trip. My friend Mckenna ordered a vegetarian burrito which I personally think may have been the call and would be my order recommendation! I also highly recommend the homemade corn tortilla chips and guacamole - an absolute highlight. Overall, this little taco stop was a great addition to our trip and I would recommend checking out this little spot on your next trip out to beautiful Stinson beach. Come for the atmosphere, stay for the tacos.